Internal advalvas, messages, work orders and so much more for healthcare organizations. OPYX is the online collaboration platform that allows you to communicate smoothly with all parties involved within and outside your organization via the channel they prefer. All in the format that works best for them. With OPYX, every type of employee has the necessary tools to contribute to efficient and structured communication. Employees keep each other informed while daily tasks such as work orders are easily distributed and followed up. Users with desktops and laptops work easily via the web portal. Mobile users work on their tablet and smartphone via the OPYX app. OPYX runs on our servers so no additional concerns arise for you. No or less stable network? No worries, you can easily read messages that have already been downloaded and create new messages / work orders. After finding a stable network, the app will automatically deliver your outgoing items. Employees who are more closely involved within their team and the entire organization become employees who are aware of the ins and outs of the organization. This makes them committed employees which will augment your service. 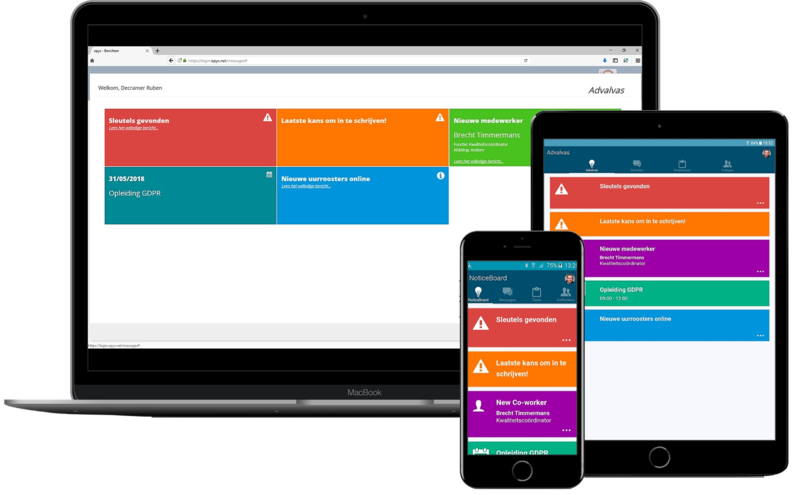 Your own collaboration platform on our servers with guaranteed privacy in accordance with the AVG (GDPR) legislation for you and your employees and partners. OPYX is completely free of advertisements and "in app purchases". OPYX will never ever share your information with others. All functionality to bring structure in communication with all your stakeholders. Send messages to another employee, teams or to all employees. With templates you can make it easier for everyone to create recurring messages. Announcements are published in no time and will be viewed by the entire staff! Important items can be highlighted. You define them yourself and assign executors who will automatically receive these orders. 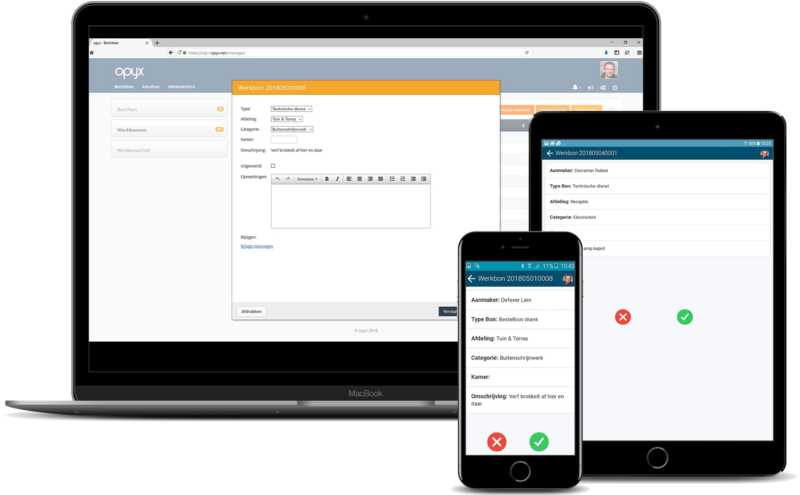 Employees can immediately report and follow up on matters that need to be resolved in your organization via the app or the web portal with or without a picture. Executors can easily indicate work orders as executed. Thanks to the seamless integration with the camera of the tablet or phone, photos can be sent as attachments. Every employee can easily be created by yourself and given the permissions that they need. They can immediately login via the app and web portal. Would you like to know whether OPYX fits into your organization?